Everyone’s nervous the first time. Hunched in the doorway of a plane listening to the 90mph wind buffeting the props, staring down at the earth 14,000 feet below, fingers white from grabbing the rail. When you finally swing yourself out into the blue, momentum carries you forwards as well as down: for a few seconds you’re ‘on the hill’. You reach terminal velocity (an unfortunate phrase, given the circumstances) in twelve seconds, experiencing about 50 seconds of freefall where you’re hurtling towards the ground at 120mph, before the chute kicks in. “Why were you kicking the door?” Andrew Wiseman asked his stepdaughter as she backed into the kitchen. “‘Tis, actually,” said Hannah, blushing. Hannah took off her leather shoulder bag, lifting the strap carefully to stop it tangling in her mass of corkscrew blonde curls. “Getting paranoid in my old age. Sorry, Hannah,” Andrew said, joining her at the table and bringing his coffee up towards his lips. His glasses steamed up instantly, so he pushed them up on top of his head. Without the heavy frames, his face looked vulnerable; sweet and mole-like. “Thanks, darling, this is lovely,” he said, smiling short-sightedly at Hannah. She looked towards him but didn’t meet his gaze, staring instead at the pinch marks on the bridge of his nose. This was even worse than she’d imagined. “Actually, it’s the weekend I wanted to talk about,” Hannah said, focusing intently on scraping the froth from the sides of the cup with the wooden stirrer. Andrew looked at her quizzically, his head tilted, crumbs spilling from his lips. Andrew reared back, holding up his hands in protest. “Hannah, you can’t be serious? You do know what you’re asking?” said Andrew, running his hand through his hair, in the process knocking his glasses off and leaving a trail of muffin crumbs dandruffing his greying fringe. Putting his glasses back on, he stared at Hannah, worry lines creasing his forehead. “Come on, darling, be reasonable. Skydiving? What were you thinking? You must have known what mum would say. To be honest, I’m surprised at you. You know better than this. It’s thoughtless to even suggest it,” said Andrew. “Hannah, sit down. We need to sort this out,” said Andrew. “I’m 18. It’s my life. I can do what I want,” said Hannah, grabbing her bag and heading towards the door. “You can’t tell me what to do,” shouted Hannah. “You’re not my dad.” Averting her eyes from the injured look on Andrew’s face, she stormed out, wincing at the sound the door made as she slammed it behind her. She strode towards the park, blood rushing in her ears. Why couldn’t he think about her instead of her mum for once? Consider this from her point of view? She’d only ever known her real father as an empty shell: an absence. Trying skydiving was the one thing that might change that. The summer before Andrew and her mum got married, they’d had a party for friends and family in Battersea Park. It was 2003, the year of the heatwave. It was really a goodbye party for Mike: a way of acknowledging that he was never getting better. Around thirty friends and family gathered under the trees in the park. Someone had brought cricket stumps, a bat and ball, but no-one wanted to play. It seemed the wrong thing, somehow, and anyway it was too hot. After the picnic, Andrew had said a few words and then her mum’s best friend Marsha Wallis – her hair, as always, swathed in a colourful turban – read ‘Freefall’; a poem she’d written about the accident and its aftermath. Hannah was in it: Mike’s pre-conceived daughter, ‘shock-shaken from the womb’s warmth,’ after her mum Allie received the call informing her that Mike’s skydive had gone terribly wrong. Marsha’s recitation over, Hannah slipped her hot and sticky hand from her mum’s grasp and walked over to Mike’s wheelchair. As always, his eyes slid over her with no sign of recognition. It was something she never got used to, this being a stranger to him. Not because he was her father, but because she’d spent so many hours visiting him. (Although he didn’t recognise her mum either, and they’d lived together for six years before the accident.) Hannah stared at Mike, noticing the gristly-looking pink and white bit on his ear where the NY Mets baseball cap was squashing it; the growing stain on his lap from his melting icecream; the string of drool hanging from his bottom lip. She stood there, transfixed, until Andrew, who’d been talking to Mike’s parents, spotted her and came over to rescue her. Remembering that day, Hannah shivered. Was that really how they wanted her to think of her father? She needed to re-frame Mike, understand what he’d been like before the accident that had almost killed him; that should have killed him. 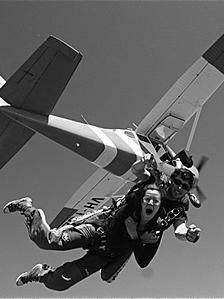 That was the real reason she’d signed up to go skydiving, the thought of which was scaring her half to death. Hannah’s legs were trembling: if she hadn’t been strapped to the front of her instructor like a koala cub she’d never have left the plane. The instructor pulled the lines and they began to turn. As they slowly gyrated, she panicked, and her thoughts started to spin out of control. What had she been thinking? pressure of it hurting her chest; making her feel like a patient, being bagged and resuscitated. The wind billowing Hannah’s cheeks sculpted her face into a Joker-like rictus. Dribble bubbled from her mouth, edging upwards and tickling the edge of her nostril before continuing its ascent; hesitating a while at the rubber seal of her goggles before lurching up, onto the lens. Seen through the trail of sticky spit, everything looked fuzzy, so she re-focused. For the first time, she really looked at the scene spread out below her: the patchwork fields, the occasional pop of yellow amidst the green, the silky ribbon of river, the light winking off the shiny carapaces of cars. Towards the horizon she caught a glimpse of the coast, sunlight glinting off the water through the pleated cotton wool clouds. It was beautiful. father had loved, all of this: the adrenalin rush; the feeling of floating on a great cushion of air; the camaraderie. She’d never felt this close to him. gently back to earth. It was only then that she cried. Hi, this is great. But didn’t you write a ‘freefall’ poem, years ago? I seem to remember strong imagery of the bloke pulling the ripcord and what happened after…? I’d love to read it again. You had posted it online on a poetry site.